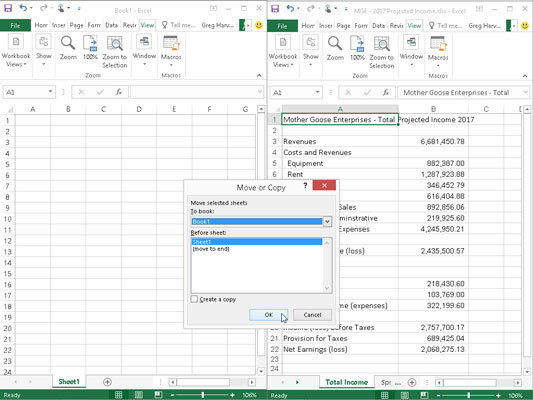 Excel opens up the Move or Copy dialog box (similar to the one shown here) in which you indicate whether you want to move or copy the selected sheet(s) and where to move or copy them. Use the Move or Copy dialog box to move or copy from the current workbook into a different workbook. To drag a worksheet from one workbook to another, you must open both workbooks. Click the Arrange All command button on the View tab or press Alt+WA and then select an arrangement (such as Horizontal or Vertical to put the workbook windows either on top of each other or side by side). Before you close the Arrange Windows dialog box, be sure that the Windows of Active Workbook check box is not selected; that is, does not contain a check mark. After arranging the workbook windows, drag the worksheet tab from one workbook to another. If you want to copy rather than move the worksheet, hold down the Ctrl key while you drag the sheet icon(s). To locate the worksheet in the new workbook, position the downward-pointing triangle that moves with the sheet icon in front of the worksheet tab where you want to insert it; then release the mouse button or remove your finger or stylus from the touchscreen. In the following figures, you can see how easy it is to move or copy a worksheet from one workbook to another using this drag-and-drop method. 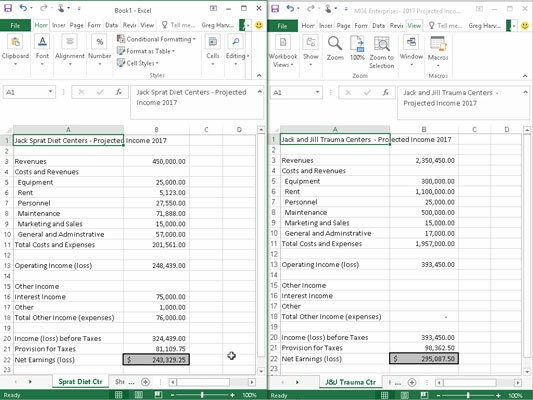 Here, you see two workbook windows: Book1 new workbook (left pane) and the MGE – 2017 Projected Income workbook (right pane). These workbook windows are arranged with the View Side by Side command button on the View tab. 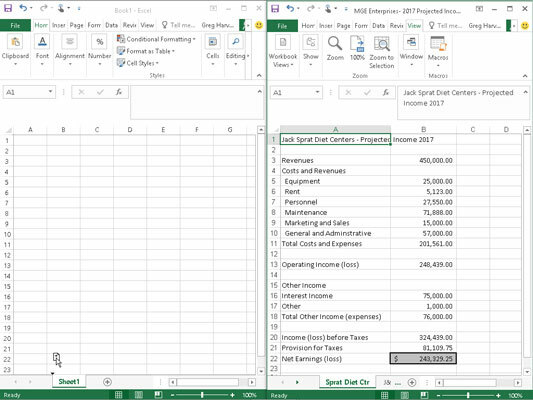 To copy the Sprat Diet Ctr sheet from the MGE – 2017 Projected Income workbook to the new Book1 workbook, select the Sprat Diet Ctr sheet tab and drag the sheet icon to its new position before Sheet1 (no need to hold down the Ctrl key as Excel always copies between data between different files). Copying the Sprat Diet Ctr worksheet to the Book1 workbook via drag and drop. Now look at the next figure to see the workbooks after you release the mouse button. As you can see, Excel inserts the copy of the Sprat Diet Ctr worksheet into the Book1 workbook at the place indicated by the triangle that accompanies the sheet icon (before Sheet1 in this example). Book1 workbook after moving a copy of the Sprat Diet Ctr before Sheet1.